A page from Theorica Musicae (1492). Philolaus (/ˌfɪləˈleɪəs/; Greek: Φιλόλαος; c. 470 – c. 385 BCE) was a Greek Pythagorean and Presocratic philosopher. He argued that at the foundation of everything is the part played by the limiting and limitless, which combine together in a harmony. He is also credited with originating the theory that the Earth was not the center of the universe. According to August Böckh (1819), who cites Nicomachus, Philolaus was the successor of Pythagoras. Philolaus is variously reported as being born in either Croton, or Tarentum, or Metapontum — all part of Magna Graecia (the name of the coastal areas of Southern Italy on the Tarentine Gulf that were extensively colonized by Greek settlers). It is most likely that he came from Croton. He may have fled the second burning of the Pythagorean meeting-place around 454 BCE, after which he migrated to Greece. According to Plato's Phaedo, he was the instructor of Simmias and Cebes at Thebes, around the time the Phaedo takes place, in 399 BCE. This would make him a contemporary of Socrates, and agrees with the statement that Philolaus and Democritus were contemporaries. The various reports about his life are scattered among the writings of much later writers and are of dubious value in reconstructing his life. He apparently lived for some time at Heraclea, where he was the pupil of Aresas (maybe Oresas), or (as Plutarch calls him) Arcesus. Diogenes Laërtius is the only authority for the claim that Plato, shortly after the death of Socrates, traveled to Italy where he met with Philolaus and Eurytus. The pupils of Philolaus were said to have included Xenophilus, Phanto, Echecrates, Diocles and Polymnastus. As to his death, Diogenes Laërtius reports a dubious story that Philolaus was put to death at Croton on account of being suspected of wanting to be the tyrant; a story which Laërtius even took the trouble to put into verse. Diogenes Laërtius speaks of Philolaus composing one book, but elsewhere he speaks of three books, as do Aulus Gellius and Iamblichus. It might have been one treatise divided into three books. Plato is said to have procured a copy of his book from which, it was later claimed, Plato composed much of his Timaeus. One of the works of Philolaus was called On Nature, which seems to be the same work which Stobaeus calls On the World, and from which he has preserved a series of passages. Other writers refer to a work entitled Bacchae, which may have been another name for the same work, and which may originate from Arignote. However, it has been mentioned that Proclus describes the Bacchae as a book for teaching theology by means of mathematics. Pythagoras and his earliest successors do not appear to have committed any of their doctrines to writing. According to Porphyrius (Vit. Pyth. p. 40) Lysis and Archippus collected in a written form some of the principal Pythagorean doctrines, which were handed down as heirlooms in their families, under strict injunctions that they should not be made public. 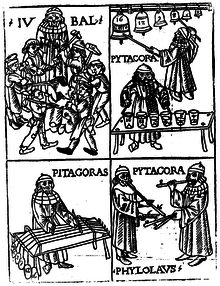 But amid the different and inconsistent accounts of the matter, the first publication of the Pythagorean doctrines is pretty uniformly attributed to Philolaus. He composed a work on the Pythagorean philosophy in three books, which Plato is said to have procured at the cost of 100 minae through Dion of Syracuse, who purchased it from Philolaus, who was at the time in deep poverty. Nature (physis) in the world-order (cosmos) was fitted together out of things which are unlimited and out of things which are limiting, both the world-order as a whole and everything in it. Philolaus is trying to show how the ordered universe that we know came into its present condition. It arose, he says, by the action of harmony on a basic substance, which we do not know but must infer. This substance consisted of different primary elements, and harmony fitted these together in such a way that nature (φύση) turns out to be an ordered world (κόσμος). Philolaus did away with the ideas of fixed direction in space, and developed one of the first non-geocentric views of the universe. His new way of thinking quite literally revolved around a hypothetical astronomical object he called the Central Fire. Philolaus says that there is fire in the middle at the centre ... and again more fire at the highest point and surrounding everything. By nature the middle is first, and around it dance ten divine bodies — the sky, the planets, then the sun, next the moon, next the earth, next the counterearth, and after all of them the fire of the hearth which holds position at the centre. The highest part of the surrounding, where the elements are found in their purity, he calls Olympus; the regions beneath the orbit of Olympus, where are the five planets with the sun and the moon, he calls the world; the part under them, being beneath the moon and around the earth, in which are found generation and change, he calls the sky. In Philolaus's system a sphere of the fixed stars, the five planets, the Sun, Moon and Earth, all moved round his Central Fire. According to Aristotle writing in Metaphysics, Philolaus added a tenth unseen body, he called Counter-Earth, as without it there would be only nine revolving bodies, and the Pythagorean number theory required a tenth. However, according to Greek scholar George Burch, Aristotle was lampooning Philolaus's ideas. In reality, Philolaus' ideas predated the idea of spheres by hundreds of years. Nearly two-thousand years later Nicolaus Copernicus would mention in De revolutionibus that Philolaus already knew about the Earth's revolution around a central fire. However, it has been pointed out that Stobaeus betrays a tendency to confound the dogmas of the early Ionian philosophers, and he occasionally mixes up Platonism with Pythagoreanism. This is the state of affairs about nature and harmony. The essence of things is eternal; it is a unique and divine nature, the knowledge of which does not belong to man. Still it would not be possible that any of the things that are, and are known by us, should arrive to our knowledge, if this essence was not the internal foundation of the principles of which the world was founded, that is, of the limiting and unlimited elements. Now since these principles are not mutually similar, neither of similar nature, it would be impossible that the order of the world should have been formed by them, unless the harmony intervened . . .
— Philolaus, Fragment DK 44B 6a. ↑ Gaffurius, Franchinus (1492). Theorica musicae. ↑ Böckh, August (1819). Philolaos des Pythagoreers Lehren nebst den Bruchstücken seines Werkes. p. 14. 1 2 3 4 Carl Huffman. "Philolaus". Stanford Encyclopedia of Philosophy. 1 2 Smith, Sir William (1870). Dictionary of Greek and Roman biography and mythology. p. 305. ↑ Scoon, Robert (1922). Philolaus, Fragment 6, Diels. Stobaeus i. 21. 460. ↑ This article incorporates text from a publication now in the public domain: Chisholm, Hugh, ed. (1911). "Stobaeus, Joannes". Encyclopædia Britannica (11th ed.). Cambridge University Press. Laërtius, Diogenes (1925). "Pythagoreans: Philolaus". Lives of the Eminent Philosophers. 2:8. Translated by Hicks, Robert Drew (Two volume ed.). Loeb Classical Library. Huffman, Carl. "Philolaus". Stanford Encyclopedia of Philosophy. "Philolaus". Encyclopædia Britannica. 21 (11th ed.). 1911. p. 414.